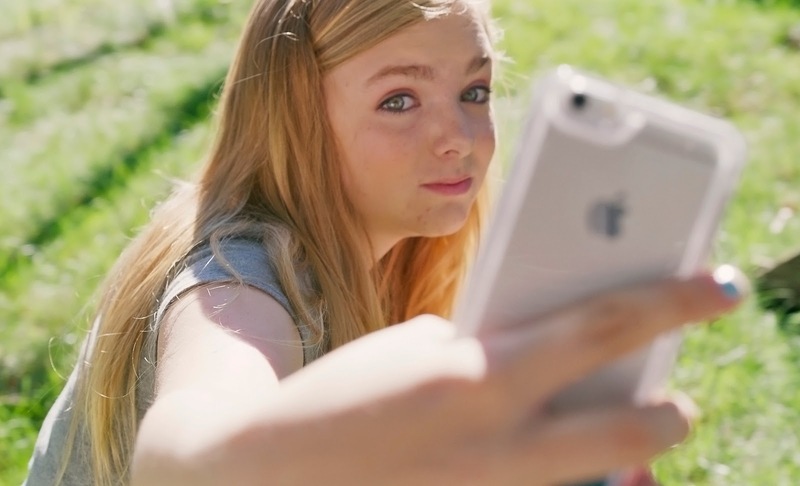 "I don't talk a lot at school," thirteen-year-old Kayla Day (Elsie Fisher) tells the camera recording her latest YouTube video which, based on the number of views her channel's uploads receive, seems to serve as a way for the heroine of former YouTube comic turned writer/director Bo Burnham's Eighth Grade to talk through her own issues in clips disguised as advice for others. Getting back to her point – following the sounds of false stops and starts often manifested in the words "like" or "um" as she tries to figure out precisely what she wants to say – Kayla looks at the camera once again, and explains, "People think I'm quiet or shy. I'm not. I just choose not to talk." 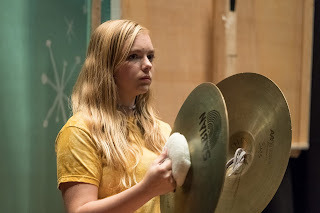 Hours later, the girl who we see strive to raise her voice a fraction as loud as the cymbals she bangs together in band practice is named "Most Quiet" by her eighth grade graduating class. And while she's quietly mortified, aside from the film's unexplored fact that at least all of her classmates know who she is (which is saying something indeed for Most Quiet), the upside to being named one of what the principal dubs "the superlatives," is that it gives Kayla an excuse to scope out her crush Aiden (Luke Prael) aka Best Eyes. 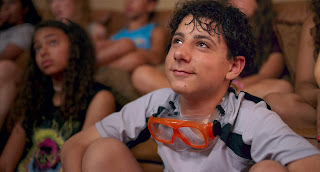 Invited by a classmate's mother to her daughter's birthday pool party the next day, even though they swim in different social circles, she takes her doting single father's (Josh Hamilton) advice to put herself out there. Making another YouTube video from her classmate's perspective to psych herself up, even before we realize that Kayla might have more than just your average case of nerves – ducking into the bathroom for what appears to be a full blown panic attack – we sense her discomfort on a visceral level. Recalling our own coming-of-age uncertainty with Burnham's "You Are Here" docudrama style of filming, from the roving closeness of Andrew Wehde’s fly-on-the-wall cinematography which vacillates between the nostalgic soft-edge imperfection of a home movie to the voyeuristic claustrophobia of a 24/7 online vlog to first time composer Anna Meredith's impressionistic score, the film's technical aspects strengthen Fisher's utterly convincing performance all the more. 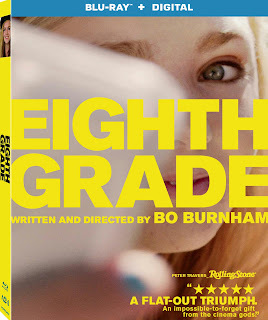 Though incidentally it was released by the same studio and producer, Eighth Grade is more than just this year's Lady Bird and similarly more than just the best look at middle school since Welcome to the Dollhouse, to which it has been endlessly compared. For while all of the titles are stellar in their own way, Grade feels more genuine than the sardonic Dollhouse and likewise, Kayla is still far too innocent to be likened to the amusing if overly dramatic Lady Bird lead. Having thrown her phone across the room when her dad startled her late at night, the symbolism of Kayla's cracked screen raises a number of valid subtextual questions regarding just how much of our alienation, anxiety, and confusion about our own self-worth (as well as each other) might come from looking at everything through the cracked screen of the internet as opposed to with our eyes. Not taking any shortcuts, Burnham trusts his audience as well as his heroine enough to know that they'll find their own way and reach their own conclusions eventually. And while even though there's an early montage of Kayla scrolling through everything from social media to stupid quizzes so quickly that it's bound to make you seasick both due to its velocity as well as obvious impact on her, the film also makes it clear that the web offers our creative introvert an outlet she desperately needs. In addition to the videos that ultimately serve as a hybrid between diary and wish fulfillment for our leading lady, in one of Grade's most touching scenes, the internet also allows Kayla to reach someone who we feel will mean much more to her than a mere number behind the view count on her screen. 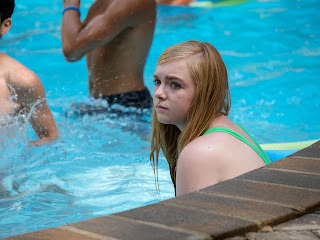 Connecting through social media to the one person who made that pool party worthwhile (played by Jake Ryan), Eighth Grade reminds us that sometimes friends can be found where we least expect it via a character who felt as though he'd fit right in with my best friends in high school. One of the best films of the year so far, it's also one you might want to watch alone for the first time before sharing it with someone else since these years can open up some old wounds (as evidenced in one unexpectedly timelier than ever scene). While unfamiliar with Burnham's entire career thus far, it's safe to say this feature filmmaking debut makes him one talent I'm excited to watch in the future. From its active shooter drill training to a debate over the differences between growing up with Twitter before Snapchat, it's obvious that Burnham is zeroing in on eighth grade 2018 (regardless of its ridiculous R rating). 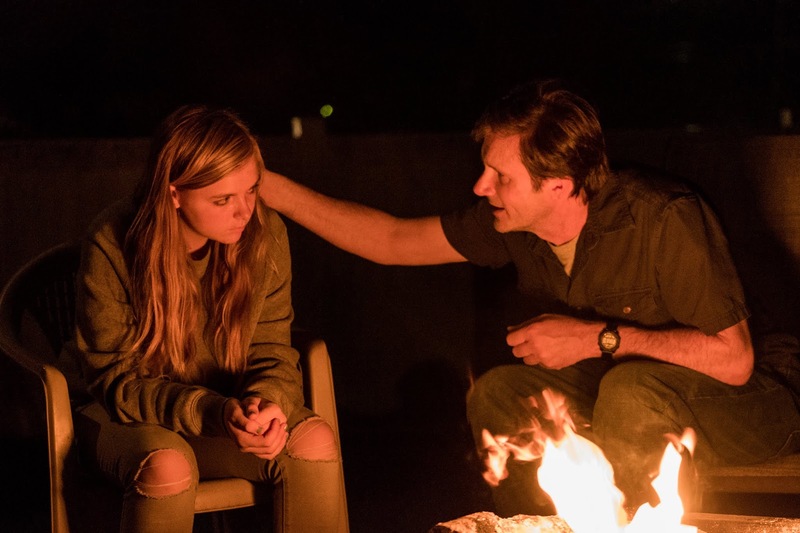 Yet whether it's been fifteen or fifty years since you were thirteen, Eighth Grade brings us all right back to that larger-than-life time in our adolescence that we think we don't remember... but for better or worse will never truly forget.